There are so many powerful winches on the market. Sometimes choosing the best winch brings lots of challenges. No one understands what we go through in the wilderness or when we get stuck. Unless you are an off-road enthusiast like others, you will know. In this post, we will share with you our perspective on what qualifies to be the most powerful winch. Q1. How Do I know the correct capacity fit my Jeep? Q2. Can I Install the Winch alone? Q3. Between a winch and towing, which one if effective? Q4. Should I buy wire rope or synthetic rope? Q5. Can I replace wireline with a synthetic rope? Smittybilt is a favorite brand and has different options for off-road enthusiasts. The 97495 XRC model comes with a loading capacity of 9,500 LB to an incredible 17, 500LB. You also have the options of choosing a synthetic winch rope or steel cable. Honestly speaking, few companies selling the best winches, will give you the option of selecting between synthetic rope or cable steel. That's why Smittybilt 97495 tops our list as a premium pick. Besides that, the two warranties protect you. There's a 3-year electrical warranty and a lifetime mechanical warranty. If you compare this to other models, you will find that the 97495 model is the cheapest. Did you know that a few companies will offer you a lifetime mechanical warranty? The 97495 model has an amphibious motor that's rated 6.6 horsepower and a planetary gear system. 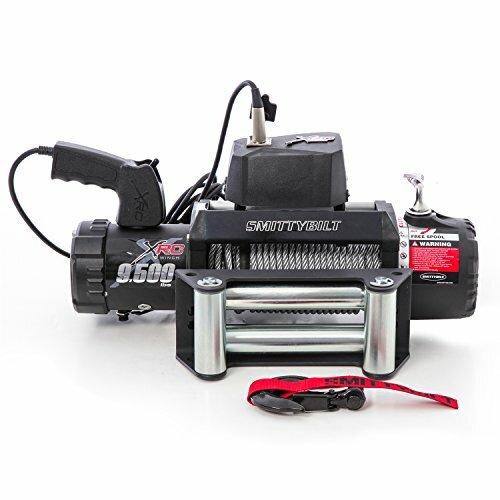 In other words, the best winch has lots of raw pulling power to get your jeep out of the mud in record time.You can read full review of Smittybilt winch review here. Like Smittybilt, Warn manufactures high-quality winches in the market. Does Warn measure up? Let's examine its features. Warn 86245 is an excellent choice for people having light trucks, jeeps, and SUVs. And it's because of its 8,000lb pulling capacity. It's not enough load capacity if you have a heavy truck. But it's enough weight to get your Jeep or light SUV out of mad. Like the Superwinch, the Warn has a light foot of cable and 3-stage planetary gear train. The Warn 86245 has corded remote control. The beauty about a winch having a remote control is, to keep your feet dry. A great, nice feature we love about the Warn model is, you can mount it anywhere on your vehicle. That means you are not in a fixed location to control your car. In other words, you can control it from any place you want. If you have used other winches in the past, you might have realized they have a specified area where you need to place it. Like any high-end best winch, the unit comes with a proprietary synthetic spy rural rope. Looking at the Superwinch, you will note that a lot of things went into its construction like the 4 1/2 horse sealed series-wound motor. There's also the heavy-duty three-stage planetary gear train. Even though superwinch has less pulling power, it has lots of power to get your out of the mud. It has lots of features to be thankful, let's look at a few of them. The 94 feet of 5/16'' steel rope cable has plenty of slack to help you latch your car into something. Okay, what about the handheld winch remote. Well, that means, you will never have to stand in the water thanks to the 15-feet cable. You will watch it as it does the job. 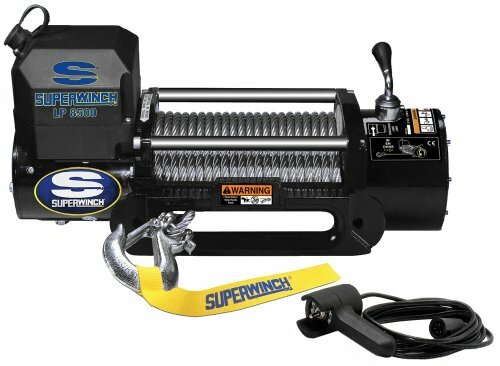 Guys who have used the Superwinch in the past narrates the story of ease of installation. That's a great plus given that a lot of us off-road enthusiasts are not mechanical. Something that's a headache for install makes out experience even harder and boring. 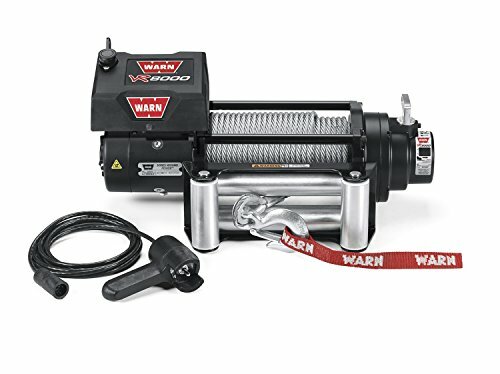 The offroad Boar is also a popular winch because of its low price and excellent performance ratings. Not everyone has a budget to own to a high-end winch, that's why we decided to include the offroad boar synthetic rope. It's a mind-pulling capacity of up to 13,000-pounds. Besides that, it has a powerful motor that boosts of 6.1 horsepower. Not every high-end winch will have that incredible capacity at a great price. You will have either to break the bank to foot the bill or save. After scrutiny, the winch provides much value for your money. It comes with a synthetic rope but not a stainless-steel cable. If this can't make you buy this winch, then I don't know what will make you. Besides that, you will note that the winch is IP67. Well, that means, it is waterproof. You will never be submerged in the water. However, if you occasionally use your truck in the cross river. It may not be the best winch for you. You are better off going with a high-end winch that offers the best buck for your money. Did I miss to talk about the planetary gears? Like Warn, the model comes with 3 planetary gears. The gears allow you to adjust the amount of torque on the synthetic rope. Well, that provides you with absolute control compared to other models on the market. Trust me. There's so much love on this model. If you get one this, you can't go wrong. With a pulling capacity of 8000 lbs., you can comfortably use it on a 4x4, Jeep, cars, SUVs, and trucks. 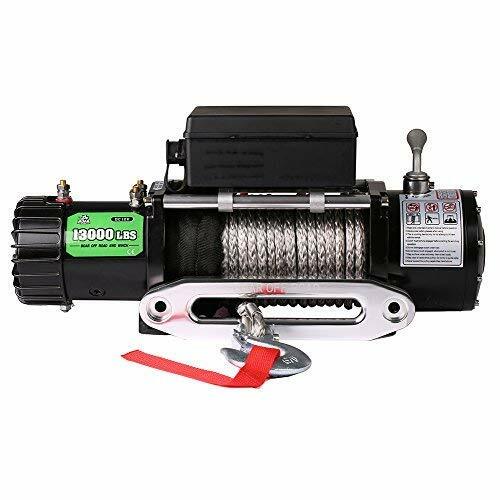 The top-rated single line on this winch offers enough raw pulling strength to do the job. The winch has a 5.5HP/3.8 KW motor which offers plenty of power to get your car out of the mud. The remote-control avails you lots of controlling options. Its gear lead deserves mention. The gear lead is 12 feet long which is an ideal level distance between vehicles. Thanks to its 3- planetary stage gear, the winch has ultimate strength and quieter operation. And I know for sure that's what you need in a winch. Its reduction ratio is something we need to talk about? The reduction ratio is 235:1, making it a high-performing winch. Because of its incredible features, I still believe the winch offers the best value for the money. 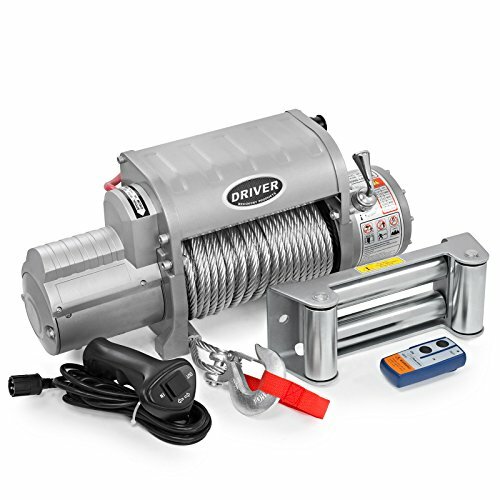 It is an electrically powered winch with an excellent package of pulling 12,000 lbs. That much power is ideal for pulling tracks. Best of all it is the one feature that makes it a robust winch for your jeep. Thanks to its reversible upgraded motor you have an actual power rate of 6.0HP and 4300 watts. The winch would be incomplete without a wireless remote control. A feature like that prevents things from getting tangled up. Its upgraded motor of 12 volts delivers the maximum torque. Thanks to its 3 stages planetary gear system you have added strength to streamline your operation in the wild. As a bonus, you will also have an automatic braking system that locks the rope to make sure the load is in the place when there's no power. Let's dig deep into the rope? First, it's extremely durable. It's has a 3/8-inch aircraft quality. Honestly, what more could you want from a winch that pulls a truck? The one thing people love about Warn 26502 is its low-profile design and different mounting options. The 8000 lbs. 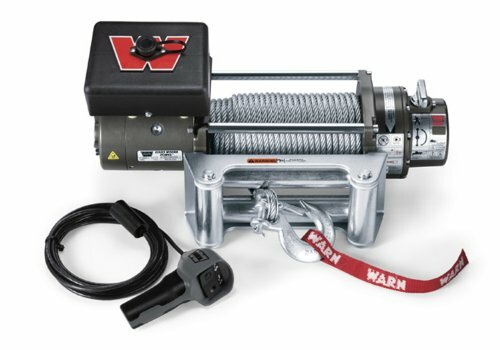 winch kit has an incredible 100 wire rope that powers load in and out. Its low-profile design is excellent for SUVs and Jeep. Thanks to its powerful 4.8HP series wound motor you have efficient and effective torque to get your jeep out of any terrible situation. The powerful engine on this winch is enough to pull trucks and SUVs. In other words, warn has your back when you get stuck in a terrible mud. The Winch has a roller fairlead. But the manufacturer also gives you an option to try the Hawse fairlead. The plus thing I saw in this winch is the automatic brake and handheld rubber controller. It's simple. Get your vehicle's gross weight, multiply it by a factor of 1.5. You will get the minimum RLP for your car. Absolutely. It is a simple process you can do it in record time. A winch is effective in all cases. It is better equipped and safer than a towing. A synthetic rope is the best option because it is super light and it can handle more tension that a wire rope. Of course. In fact, the most manufacturer offers after the market services. Feel free to replace the wireline rope if you don't like it. It's no secret that off-road adventure is an addiction. An addiction that only a few fellow off-road enthusiasts understand. But that adrenaline and irk of navigating the toughest terrain can be short-lived or end. Perhaps make your off-road experience even more boring and tiresome. I guess you don't want that to happen. Well, you can forget these nasty experiences, if you buy the best winch. The best winch will save you lots of frustration and headaches when you are stuck in the middle of nowhere. You may not need the best winch so far unless you find your monster stuck in the mud with no tow company nearby. 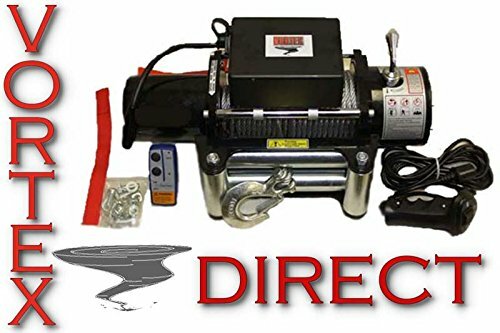 Let's forget that experience and invest in the best winch so far. Trust me. You won't regret it.